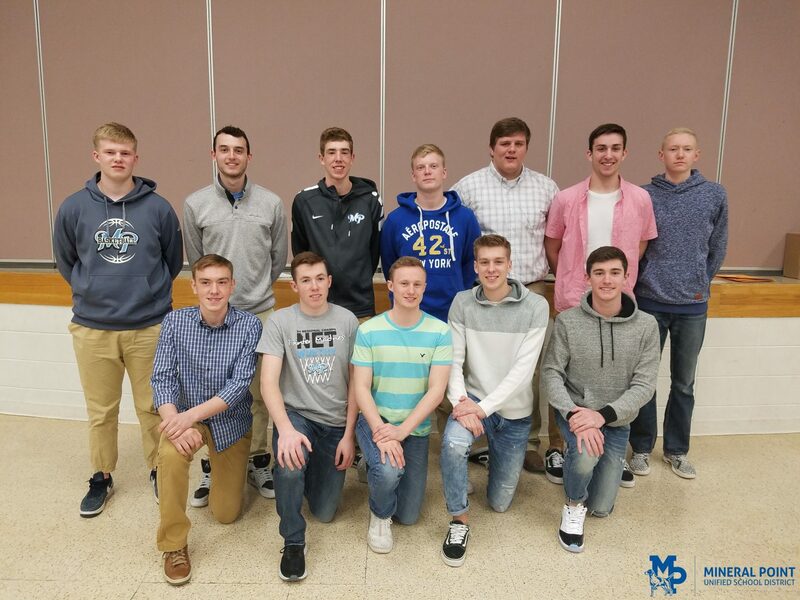 The Mineral Point High School Basketball team held its awards banquet Sunday, April 8 in the cafetorium. The varsity was celebrated for its 21-5 record and 1st place finish in the SWAL Conference at 13-1, WIAA Regional Championship, as well as advancing to the WIAA Sectional Final game. The varsity reserve finished 16-6 overall, and 11-3 in SWAL play (good for 2nd place). Wes Berget: Honorable Mention Wisconsin State Journal All-Area, 1st Team Dodgeville Chronicle All-Area, Honorable Mention Dubuque Telegraph Herald All-Area, 1st Team SWAL All-Conference, Team Most Rebounds, Team Most Blocks, Best Team Field Goal Percentage. Brayden Dailey: 1st Team Wisconsin Basketball Coaches Association All-State, 2nd Team Wisconsin State Journal All-Area, 2nd Team Dubuque Telegraph Herald All-Area, Dodgeville Chronicle Co-Player of the Year, 1st Team Dodgeville Chronicle All-Area, 1st Team SWAL All-Conference, Team Leading Scorer (places him 3rd behind Pat Murphy who holds the 1st and 2nd spots), Best Team 3 Point Percentage, Best Team Free Throw Percentage. Isaac Lindsey: 1st Team Wisconsin Basketball Coaches Association All-State, Honorable Mention Associated Press All-State, 1st Team Wisconsin State Journal All-Area, 2nd Team Dubuque Telegraph Herald All-Area, Dodgeville Chronicle Co-Player of the Year, 1st Team Dodgeville Chronicle All-Area, SWAL Conference Player of the Year, 1st Team SWAL All-Conference, Team Most Steals, Captain. Chance Wendhausen: Wisconsin Basketball Coaches Association Senior All-Star Game Participant, Honorable Mention Wisconsin State Journal All-Area, Honorable Mention Dubuque Telegraph Herald All-Area, 1st Team Dodgeville Chronicle All-Area, 1st Team SWAL All-Conference, Scored 1000th Career Point (5th player in MP History to do so), Team Most Assists, Captain, Team MVP. Garrett Wendhausen: Team Free Throw Ladder Champion, Team Most Improved. Dan Burreson: SWAL Conference Coach of the Year, Dodgeville Chronicle Coach of the Year. Coach Burreson said it’s easy to get caught up on the last game of the year, thinking of the “could’ve, would’ve, should’ve” but it’s the big picture that should be kept in mind. The team made it to the Elite Eight. After a 6-4 start to the season, the team rattled off 15 straight wins. In the roughly 100 year history of Mineral Point basketball, this is only the 7th time a team has won 20 or more games. Burreson would describe this year’s team as “resilient,” citing the team’s tough schedule, which will be “even tougher” next year. The team will again play in the Wisconsin Basketball Yearbook Shootout in Mequon over Christmas Break, as well as the Midwest Players Classic in La Crosse in January.